Just in time for Halloween, Susanna Leonard Hill’s blog is chock-full of fun-sized stories! Susanna is hosting her 5th Annual Halloweensie Contest. The rules for this year’s contest are to write a 100-word or less Halloween story for kids, using the words costume, dark, and haunt (or any variation like costumed, darkened, haunted, etc.) If you’re reading this and it’s before Friday, October 30th at 11:59 pm, you’ve still got time to join the halloweensie parade. 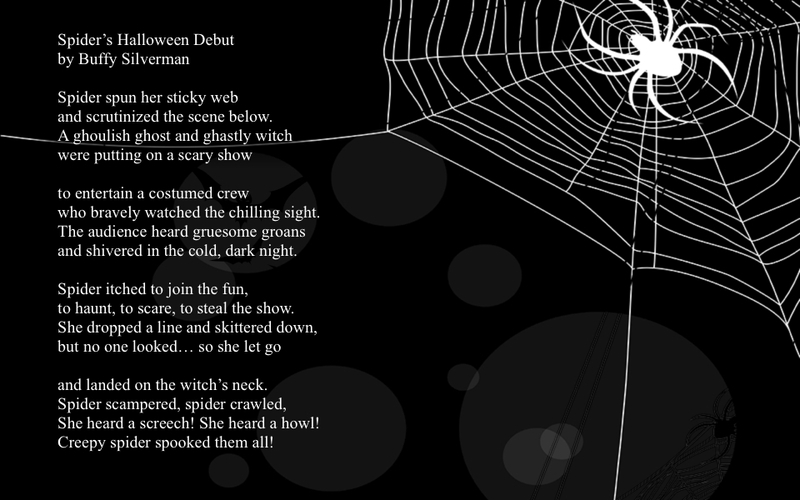 Visit Susanna’s blog to find links to all the Halloweensie entries. and scrutinized the scene below. who bravely watched the chilling sight. and shivered in the cold, dark night. to haunt, to scare, to steal the show. and landed on the witch’s neck. She heard a screech! She heard a howl! Creepy spider spooked them all. Happy Halloween and Happy Early Poetry Friday. Visit Jone at Check it Out for more poetry friday treats. This entry was posted in Uncategorized on October 28, 2015 by Buffy Silverman.